Not all marigolds are created equal. The National Institutes of Health explains that the marigold you find in most home gardens is of the tagetes variety, which are purely ornamental. The marigold variety that delivers health benefits is calendula. 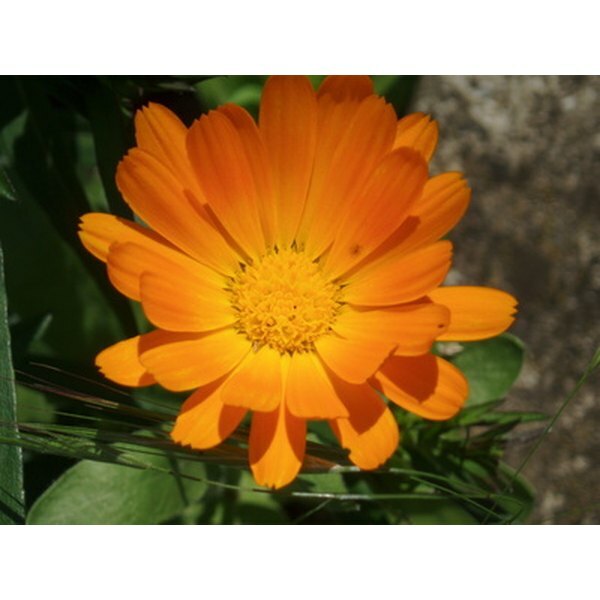 The flowers of the calendula marigold have been used for centuries for their health benefits. Marigolds contain numerous antioxidant carotenoids that give the petals their bright orange and yellow colors. An antioxidant is a compound that helps protect the cells from damage caused by free radicals, or hazardous molecules. Free radicals are the by-products of normal body functions or environmental factors such as cigarette smoke or pollution. Free radicals can damage cells to the point that they damage DNA, and can lead to disease and various forms of cancer. High intake of antioxidants helps combat free radical damage. The primary carotenoids in marigolds are lutein and zeaxanthin, often paired together, and lycopene. The Linus Pauling Institute reports that lutein and zeaxanthin are the only antioxidants that are found in the retina of the eye, where they protect the eye from the development of cataracts and macular degeneration. Lycopene is reported to reduce the risk of prostate cancer and heart disease. The antioxidants in marigolds help fight and prevent cancer, according to a study in the October 1998 issue of The Journal of Nutrition. In this study, researchers from Washington State University examined the effects of lutein, an antioxidant extracted from marigolds, on breast cancer tumors. The results of their study show that lutein not only reduced the number of tumors in the breast, it also prevented new cancer cells from developing. Researchers found that even in small dietary amounts, the lutein from marigolds had a positive effect. Marigold has also been found effective against leukemia, colon and melanoma cancer cells. One of marigold's folk uses has been in the area of wound healing. Rubbed on burns, scrapes and irritated skin, marigolds provide relief. When tested on rats, researchers in Brazil found that one of the mechanisms for wound healing comes from marigolds having the ability to promote the growth of new skin tissue, as well as new blood vessels that feed the skin. In the February 2011 issue of the Brazilian medical journal Acta Cirurgica Brasileira researchers also state that marigold acts as an anti-inflammatory due to the presence of other compounds, including triterpenes and steroids. Calendula marigold petals can be dried and used as a spice in place of saffron, steeped in hot water for a tea or used fresh on salads. Keep in mind that marigolds are an herbal product, and as with any herb there is a risk of adverse reactions or side effects. If you are currently being treated for a medical condition or are on any medications, speak to your doctor before consuming any herbal products, even marigolds.